Professor John Pandolfi and members of the Marine Palaeoecology Lab attended the Subtropical Bleaching Workshop hosted by the National Marine Science Centre in Coffs Harbour, NSW. Collaborators at the workshop included members from Southern Cross University, University of Sydney, the local Coffs Harbour community group SURG (Solitary Islands Underwater Research Group), and the Department of Primary Industries. The aim of the workshop was to bring together survey data of the 2015-2016 bleaching event across the subtropical region and prepare an outline for further work on a manuscript. The paper will document the pattern of bleaching across the subtropics, from Moreton Bay, QLD to Black Rock, NSW, as well as investigate mechanisms driving spatial variability in patterns of bleaching. The bleaching surveys in the subtropics showed that some coral genera, namely Pocillopora, encrusting Porites and Turbinaria, were more severely affected than other taxa, such as Acropora. The surveys completed are the most widespread bleaching recorded in this region since quantitative surveys commenced in 2002. Professor Terry Hughes and Dr Andrew Baird from James Cook University also attended the workshop and presented findings of the bleaching across the Great Barrier Reef, as well as some of the post-bleaching survey data. 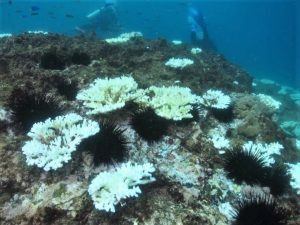 The preliminary findings showing that the North Great Barrier Reef has suffered the greatest loss, with an average of 67% of shallow-water corals dead. The Marine Palaeoecology Lab thanks Dr Hamish Malcolm, and others at the National Marine Science Centre, for organising the workshop and the warm hospitality shown.